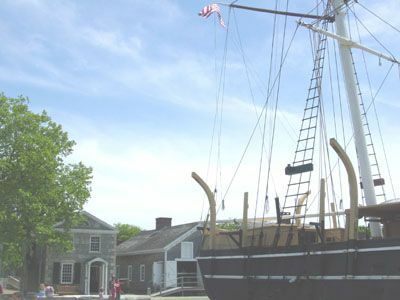 Not named for its spooky nature, but rather as it is located on the banks of the River Mystic, this is actually one of the largest maritime museums in the country with some stunning historic examples of ships from the region. This includes the last remaining example of a wooden whale-ship, along with plenty of other ships. You can also enjoy a trip along the river in one of the ships, or even find yourself at the helm of one of the classic yachts that are moored here. This odd little museum is run by John Zaffis, the nephew to two prominent paranormal investigators, and having joined his aunt and uncle in exploring the unexplained, he has developed an amazing collection of oddities and trinkets said to have been haunted or been involved in unusual happenings. This includes an old military coat that gave a young girl bad dreams, along with a ventriloquist's dummy, tribal masks, and a black iron human skull said to have been used in unholy black magic rituals. They say that some of the best minds are to be found at the Ivy League universities, but in this unusual collection that is a part of Yale University, there are a wide variety of brains that have been preserved because they have been found to have diseases such as brain tumors and other conditions. The collection was donated to the university after Harvey Cushing passed away in 1939, and there is also an interesting collection of historic medical items and oddities that are also worth seeing. One of the spookiest and eeriest roads in the state, this single track lane plots a route through woodlands near the town of Shelton and is said to be one of the places where people from a Connecticut legend, 'The Melon Heads' are sometimes spotted. These are said to be simple people that have deformities to their heads, and who live a simple secluded life away from the rest of American society, but whether you spot them or not this is certainly an eerie road, particularly if you drive it in the dark. Just another bridge crossing another American River, The Frog Bridge was completed in 2000, and is around five hundred feet in length, with just one feature that makes it stand out. At the four corners of the bridge, there are large sculptures of frogs mounted on plinths that are carved to look like spools of thread. This dates back to a legendary shower of frogs in the town in the eighteenth century, which frightened the residents into firing weapons on the frogs, which eventually became adopted as a symbol of the town. Another interesting aspect of the Yale University campus, this collection of historic books has some unusual and downright odd manuscripts, from the manuscript of a prisoner who believed he was haunted in the nineteenth century, through to a collection of ornately decorated Jewish marriage certificates. The highlight and the most famous item is the fifteenth-century Voynich Manuscript, written in an unknown language and beautifully decorated with drawings of plants that haven't been identified, and characters from myths and lewd depictions of people. New England Cottages Vacation Rentals in Connecticut and beyond!